A moment of madness by Vedran Janjetovic has cost Western Sydney a shot at harbour city bragging rights, the Wanderers going down 3-1 to Sydney FC in a match delayed almost an hour by heavy rain and lightning. With his team leading on Oriol Riera's early opener, Janjetovic was red-carded in the 25th minute after handling the ball outside his box. Sky Blues pair Alex Brosque and Siem De Jong then goaled either side of the break before substitute Jacob Tratt sealed the result late. The Saturday night win ensures the title favourites consolidate third spot on the A-League table and leaves the Wanderers with just one derby win in their past 16 meetings. Janjetovic's mistake - in his 150th A-League match - came seconds after he needlessly came out of his box to field a long ball, only to miscue his run. Instead it fell to Adam Le Fondre's feet and his attempted shot was parried by the former Sydney FC goalkeeper despite remaining out of his restricted zone. The brain snap instantly ended a dominant start by the hosts and was followed by a curious Markus Babbel decision to take off Alex Baumjohann. The German star, who has arguably been the Wanderers' best this season, was furious as he disappeared up the ANZ Stadium tunnel. And their scoreline advantage went with him not long after, with Brosque the first to react to a low Josh Brillante fizzer that hit the post just before halftime. It was his fifth goal in the derby - the most in the rivalry's six-year history. It didn't take long for the visitors to take the lead after the break, with de Jong given oodles of time to fire home after the Wanderers failed to clear a corner. The win came despite Sydney FC losing veteran Alex Wilkinson to a virus on game day and then defensive partner Jop Van Der Linden to a knee injury in the first half. Van Der Linden limped off in the 15th minute then substitute Aaron Calver exited with cramps in the second half but by then the contest was over. The miserable conditions delayed kick-off twice before lightning forced officials to push the start a third time. They were also almost certainly a factor in the derby's lowest ever crowd of 18,043. Sydney FC coach Steve Corica hailed his team for remaining focused on the task despite the late start and red card. "Sometimes it's difficult as well when they go a man down, to break them down. They stay very compact and you've got to find a way to do that," he said. "We had a lot of ball and in the end we broke them down and got the goals we needed." 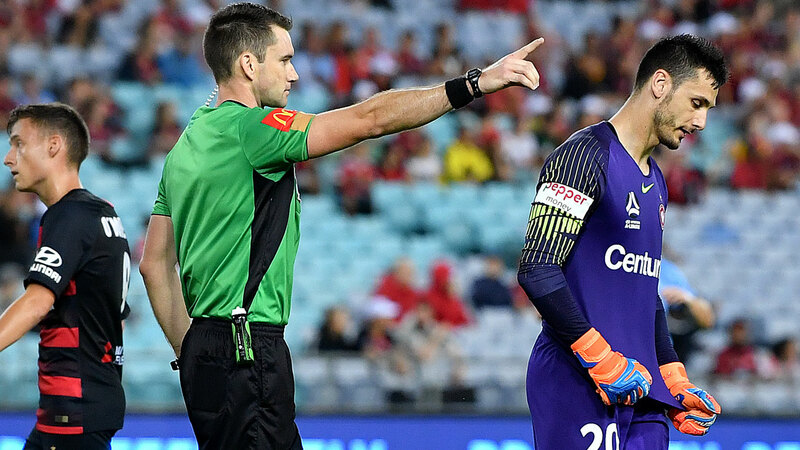 Wanderers coach Markus Babbel admitted the Janjetovic error came at a crucial moment. "I hadn't had a good feeling at this moment because we make three mistakes in one action," he said. "This is very hard because until this situation we were good in the game. We created good chances, we scored, but it wasn't the best idea from (Vedran).